This is a quite famous bike tour for bikers starting from Stockholm. Getting to Täby can be quite tricky if you don’t know the place and you want to ride on bicycle paths. Anyway there are signs guiding you to Täby. Passed Rybdo you need to cycle for some 4kms on a big road where cars drive pretty fast. There is no other way to get closer to Vaxholm from there but you can use the emergency lane when it is available and in Sweden car drivers are very kind to bikers. Once out of the big road you can ride quietly for 10kms on a typical swedish road sorrounded by woods and with few cars passing. This road will take you to Vaxholm. There you can take a ferry which will bring you to the island of Rindö. The crossing takes about 5 minutes (time tables and other info here). On the other side of Rindö another ferry will take you back on the “mainland”. From there you can enjoin other 15kms of quiet road which will take you close to Gustavsberg. From Gustavsberg the way back to Stockholm is mainly on bicycle paths. If you happen to run your own server you need to think about backups. Now you have a .sql file, which contains your database, stored into the /var/local/backups/mysql/ folder. Is your database safe now? Well, no! What if your server dies? What if you loose all the data on it? Better move the database’s dump somewhere else! Amazon S3 is a cloud storage service which ships with a very practical CLI tool. In order to use it you need an amazon’s account and you need to install and configure the CLI tool. Steps 1 and 2 are done just the first time while 3 and 4 should be performed repeatedly (i.e. schedule them). this will run the script every day at midnight. Il servizio sarà gratuito 8 giorni quindi non basterà per coprire l’intera durata delle olimpiadi, alla scadenza del periodo di prova occorrerà pagare secondo questa tabella http://www.unotelly.com/unodns/pricing. Una volta finite le olimpiadi si consiglia di ripristinare le impostazioni del computer a meno che non si volgia continuare ad utilizzare il servizio UnoDNS. P.S. per godere di una migliore visione collegate il vostro computer alla televisione. Last days I’ve been developing a very simple custom post type for WordPress. Title and description are already provided by the wordpress built-in post type, that means we just need to teach wordpress how to manage date. In order to keep the code clean all the Custom Type’s code is inside a class Event which is inside a folder ‘custom_types’ whithin the theme’s folder. the meaning of all these features is well explained on the official documentation. Here we are defining which columns will be used on the listing table of our custom type, the parameter $custom contains the default post columns, we could decide to unset some of them and add ours or (as shown above) just return an array with the columns we want. As you can see we return 3 ‘built-in’ columns (title,author,tags) + our custom column (event_date). here we say: ‘whenever you are rendering something about column event_date, print the Event’s date, we will se later on what’s inside Event::get_date($post), remember Event is the class containing our Custom Post type definition. At this stage we are ready to find out a new menu point on the admin backend called ‘Events’, the table listing all the events (no one until now) and the page to edit/insert a new Event. What? there is no ‘event date’ field on the edit page? Yes, we need to specify a custom post field in order to be able to add this feature to our Events. add_meta_box add a new box on the post editing page, the third parameter is the one which specify which function will render the box. As you can see Event::date_edit outputs an input field which our users will insert the date. We need to define also what WP should do with the user input once the post is saved/deleted. In the first case we store the input on the database by means of date_insert (actually here we check the date format and if it is valid we turn it into timestamp befora storing). update_post_meta add/update a custom post field with name ‘event_date’ at the event we are saving. Here we search for the custom value on the db, if it exists we turn in back to a human-readable date otherwise just return an empty string. In case we delete and event we teach wordpress how to delete the custom field ‘event_date’ by means of delete_post_meta. Now we are done, our brand new Event Custom Type it’s on-line and users has the possibility of inserting the event date. This way we make WP load all the scripts we need. Here we go, now our custom post type admin interface in ready! When developing the POJO classes for mapping the database I set the fetch type to LAZY. At first i didn’t pu much interes on it but then when I was actually fetching the data from DB I had to lern it better. But this didn’t worked. When an entity is instanciated all its collelctions are defined but the content is not loaded, infact lazy loading means Hibernate would fill the collenctions when them are requested. If you try to retrieve all project’s expenses into the EJB there are no problems as an Hibernate session is opened. When we are into the view context (JSP in this case) there are no Hibernate sessions opened that’s why the expense collection could not be retrieved. If the fetch mode is set to EAGER Hibernate load all entities collection whe the entity itself is istanciated. The view above would display all the data correctly but if we add a new expense it won’t be added to the collection as the main entity has already benn loaded. The best solution would be create a Filter which open and close an Hibernate session at view context to lazy load the collections whenever are needed but seems like this way-around exists only in Spring Framework. The fixeed this problem with in a ‘dirty’ way building a emporary container which collect the projects data every time the page is requested. This is not as performant as lazy loading because it fetches all the data at each request. But it finally make the view display all data. Here we come with bad notes. I was not able to implement some logic with Stateful Session Bean in my application. First it was difficult to find a place for such a thing inside my application then I wasn’t able to find good instruction on how to couple Stateful Bean with Servlet. This post should have been one of the first actually. Here is described the design pattern used on Common Expenses, I’ve used MVC as it is very straight forward: separate data management (model), application login (controller) and presentation (view). 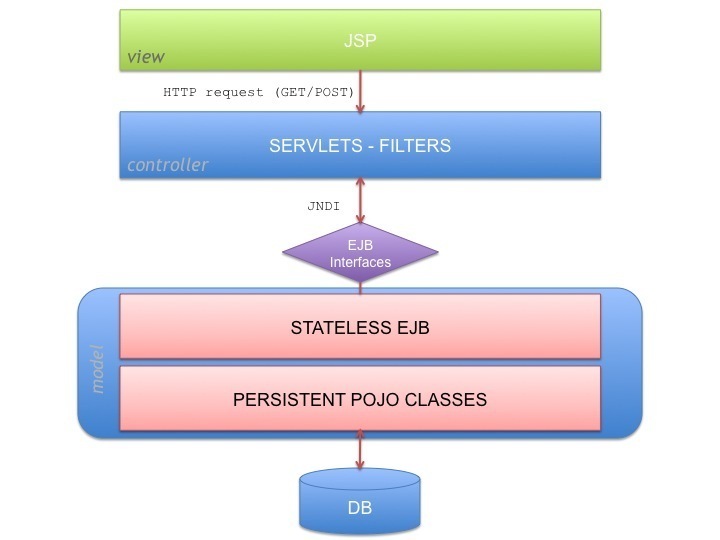 As I post earlier the persisten layer is made with Hibernate, then the Businnes Login is implementend via Stateless EJB. The application controller is a set of Servlet which get requests, work out them and send the result to the presentation layer. The presentation layer is implemented with JSP. To communicate with POJO entities I’m going to use EJB version 3.1. As done before I will use annotation instead of a XML configuration file. I will come back later with a full post on how to couple EJB with Hibernate. Remote means that this is he ‘server‘ class, in this instance our client will be the Servlets but if it would have been another java application we would have to distinguish between Remote and Local. Stateless means that the bean doesn’t keep a ‘memory‘. There’s no need to use JNDI explixity because annotation will do it for us.